This week has been a SCORCHER! How does your family cool off? Beach? Pool? Lemonade? My family loves a cool treat. While ice cream is an old favorite, we are trying to lead healthier lifestyles. The nice cool solution we have found is Frozen Yogurt! When my kids beg for ice cream... I now bring them to Yogurtland! They seem to be everywhere and the kids really don't know the difference. All they know is that is cools them off and they get a special treat. 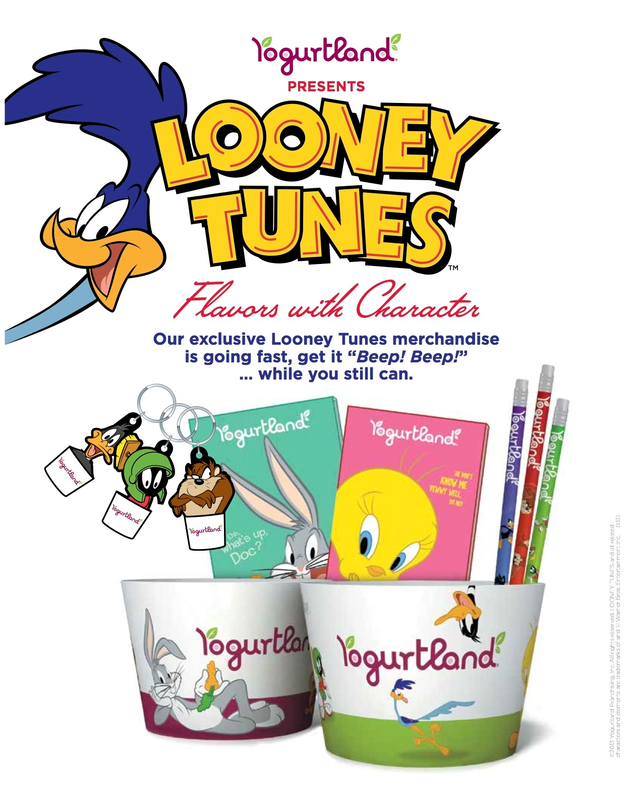 Yogurtland has partnered up with familiar faces this summer. Loony Toons! While many of our children are not as familiar with them as we are, the kids love the whimsical and funny characters. The Road Runner and Wile E Coyote are our favorites. Starting July 8- September 15, Yogurtland has Bugs, Daffy, Road Runner, Tweety, Marvin and Taz incorporated into their 6 new summer flavors. 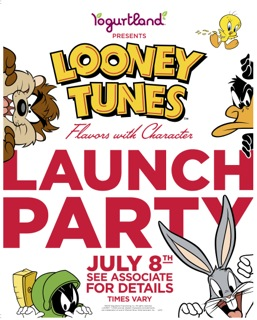 On July 8th, at select Yogurtland locations, there will be special character appearances, prizes and free yogurt parties. My family will be attending the Rossmoor location on that day. 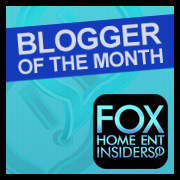 Would you like to win some free Yogurtland yogurt? Daffy Duck is my favorite. can't go wrong with Bugs Bunny! Tweety bird is a cutie!